MOVING VIOLATION: Chasing And Crashing In A Bi-Polar Mood – Schlockmania! Like any good producer of exploitation fare, Roger Corman went through phases in his output fueled by what was popular in the market at a given moment. 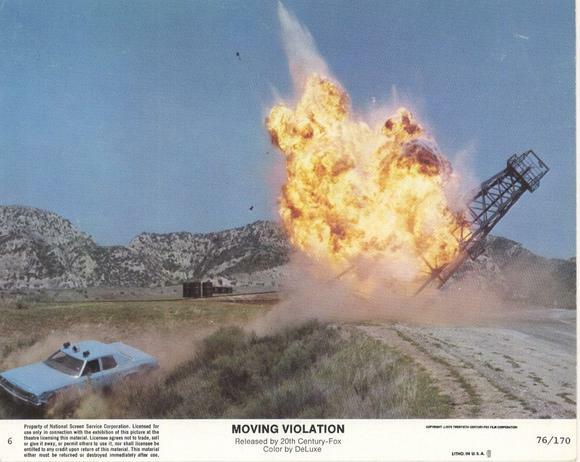 When car-chase movies came into vogue during the mid-1970’s, he quickly entered the fray with a variety of entries into this subgenre: Death Race 2000, Cannonball and Eat My Dust are just a few. Another was Moving Violation, a film he served as executive producer on during a brief partnership with 20th Century Fox (wife Julie Corman handled the main producing gig). It’s neither the best or the worst of his car-chase flick output but it does have some elements that will intrigue the b-movie scholar. For starters, Moving Violation isn’t just a car-chase flick. It also has a certain paranoid thriller element to it that doesn’t always mix well with the car-crashing hijinks. The protagonists are Eddie (Stephen McHattie), a cynical drifter wandering through the South, and Cam (Kay Lenz), the drive-in waitress that he picks up. The two sneak onto the grounds of a mansion belonging to local millionaire Rockfield (Will Geer) to do a little canoodling but get more than they bargain for when they see corrupt Sheriff Rankin (Lonny Chapman) shoot down a deputy who wanted to blackmail him and Rockfield. The sheriff sees the lovebirds escape and thus begins a chase through the back roads. Eddie and Cam do their best to stay ahead of the Sheriff, who frames them for the death of the deputy. The evil lawman brings in every policeman in every county they pass through, forcing Eddie and Cam to constantly steal new cars as they try to drive their way out of trouble. It seems the heroes will catch a break when they enlist the help of flamboyant lawyer Alex Warren (Eddie Albert) – but they have to make it to the courthouse to surrender and the Sheriff is determined to shoot them on sight. The premise is workable for a drive-in quickie but the treatment it gets here is unwieldy. 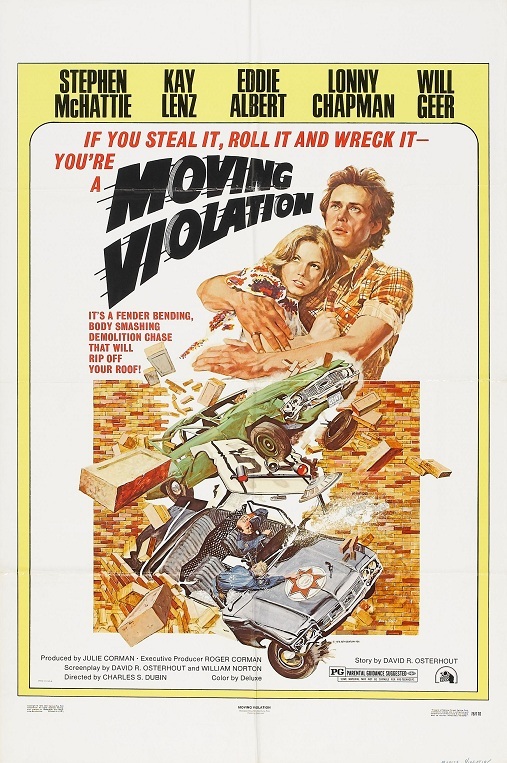 The main problem with Moving Violation is its tone, which veers back and forth between broad slapstick comedy (complete with bluegrass music on the soundtrack) and a cynical, downbeat mood shot through with the occasional burst of violence. It’s hard to get a handle on a film when it’s coming on like Smokey And The Bandit one moment and Macon County Line the next. It also suffers from a certain sloppiness at the scripting stage. Characterization is subordinate to chasing so we never really get a sense of who Eddie and Cam are beyond their surface attributes. The Sheriff fares worse: he’s written as a sociopathic figure of corruption one moment and an inept bumbler in the Roscoe P. Coltrane mode the next. More importantly, the ending is bungled: without getting into spoilers, the film takes an abrupt and hasty turn in its final reel before stopping on an odd, inconclusive note that leaves a bunch of loose ends flapping in the breeze. That said, Moving Violation is never dull. T.V. veteran Charles Dubin directs in an economical style that doesn’t show much personality but keeps the plot and the chases rolling at a steady clip. 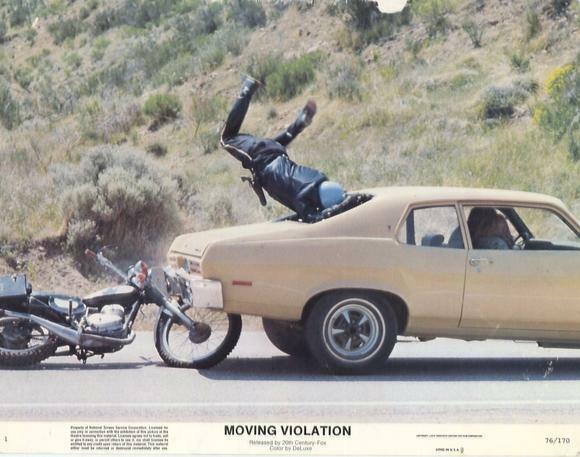 It helps that the crashes were handled by stuntwork pros like Conrad Palmisano and Vic Rivers. McHattie and Lenz make for appealing leads and do their best to flesh out their sketchy characterizations. Amongst the supporting cast, Geer offers a smoothly villainous turn in his brief role and Albert fares the best as the lawyer, adding some sarcastic charm and getting all the best lines in the script. Ultimately, Moving Violation is a middling programmer. It’s not particularly inventive and is too schizoid in tone to hold up to repeat viewings but it moves quickly enough to make a painless time-killer for the Corman completist. Fighting Mad / Moving Violation [Double Feature] Fighting Mad: An Arkansas farmer stages a one-man war against corrupt land developers who want to evict him and his neighbors from their farms for real estate developments. Moving Violation: A young couple witnesses a sheriff murdering a police officer. When the sheriff realizes that they saw him commit the crime, he characterizes them as terrorists and tries to frame them for the murder. DEATH VALLEY: The Least Likely Slasher Movie Ever?